After passing multiple stores in London (When I was visiting on my holiday earlier in October) and finding bits and bobs in giftware shops, I have currently been obsessing over all of the lovely Cath Kidston products available. After first discovering them, I browsed the website and was looking at all of the pretty and adorable patterns, thinking I needed to buy everything that I loved, which the majority of the time ended in me filling up my cart and sadly passing it by! 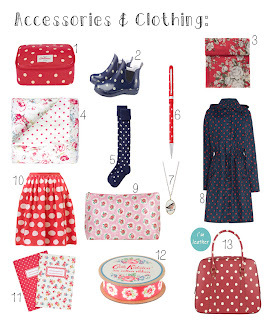 So after creating this wish list for you all, I caved in and decided to buy a polka purse in red and cream spots. I absolutely adore the design and cannot wait to use it! The picture of the purse is unfortunately not visible in one of my collages, because it would have gotten pretty ridiculous with the amount of items I insisted on putting on there, so I had to contain my excitement a little and minimise my wish list. So instead here is the link to the (Polka Dot Purse) and this will take you directly to the Cath Kidston website! All of the items are found on the official Cath Kidston website so instead of linking each individual item, I have place the official link at the bottom of the post and have co-ordinated each number and item with the original name from the site to make it easier for you to search for anything that your heart desires. 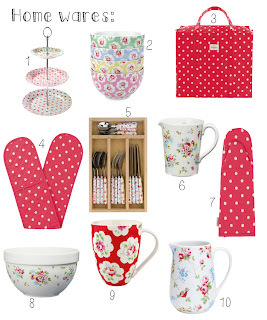 So I am sure one day I will have my very own Cath Kidston product collection in my future apartment or home. For me personally the lines of products on offer do not scream out one particular theme of either vintage or modern. I consider them to be a mix of the two, which makes them unique and beautiful with there designs and easier to incorporate within your own living space to suit your style and colour scheme. So for now I will just have to continue admiring all of the products and occasionally place a sneaky order along the way, collecting little bits and bobs.